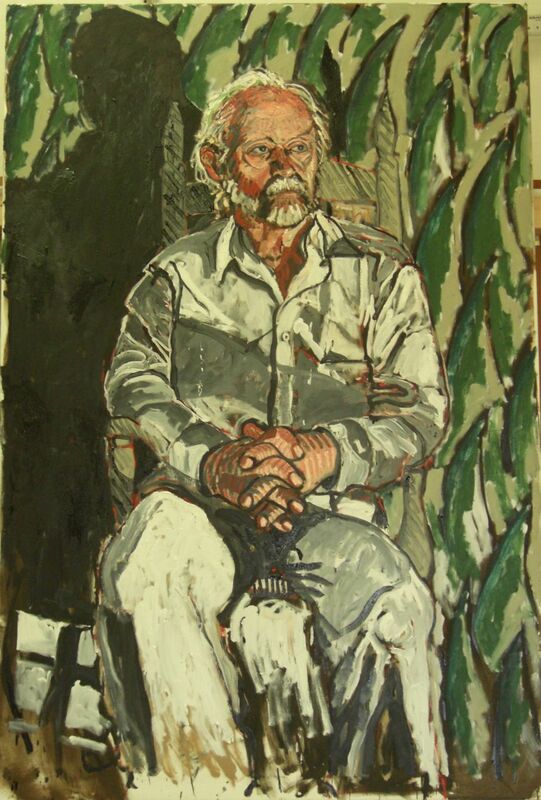 Derek Guthrie lived and worked in St Ives as a successful painter in the 60s before moving to Chicago and co-founding, in 1973, the 'New Art Examiner', an influential American art magazine which continued production until 2002. He moved back to Cornwall in 1996. Can we start with some early biography to set the scene? I was born in Liverpool in 1936 and my mother and father and I moved to Wiltshire circa 1942. I was sent off to a deplorable boarding school, Prior Park College in Bath. The school was run by the Irish Christian Brothers who were brutal and stupid yet had pretensions to culture and faith that were unobtainable for most of them. I am pleased to say that the order is virtually extinct. I left a very messed up kid and went to the West of England College of Art in Bristol. 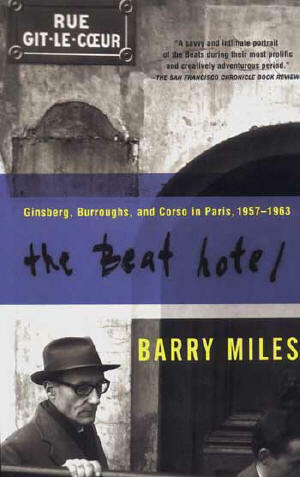 Owing to restlessness and instability - in part caused by minor dyslexia - I went to Paris circa 1958 and and ended up at 9, Rue Git le Coeur, now a famous address, which was inhabited by Allen Ginsberg, Gregory Corso, and William Burroughs. Yes. I was young and nervous and naive and watched. I could not understand why they all lived in Paris as they had no interest in France or French culture and spoke of freedom all the time. Burroughs was quiet and thoughtful and open to conversation. I attended a private Atelier de Feu owned by an Hungarian sculptor called Gabo. I absorbed all that the left Bank could offer though I did not process that for a number of years. With little money left I then hitched to Ibiza before tourists discovered it and it was still traditional. The education continued and some awareness of Spanish culture and experience of a fascist state entered into my awareness. On returning to the UK I lived in the Portobello Road and was fortunate enough to have watched the build up of West Indian population and the beginning of the first riots a few blocks from my residence. Again invaluable experience that proved to be useful and a foretaste of things to come in England. During my first year as a student at the West of England College of Art I hitched (everybody did then) to St Ives and was shown around by a dear man - Keith Leonard - a sculptor who had worked for Barbara Hepworth (picture below right). What were your impressions of St Ives at that time? The sheer beauty of the Island, the town, the sea and the sky and the wild forces of nature mixed with the serenity of calm when the wind is not blowing told me, a unsettled kid, that I had found home. Though I could not stay, I returned many times and in spite of a stay on the continent and London I painted with thick impasto paint, rock formations, sky, and beach. After a year of so in the Portobello Road with joy I returned to St. Ives and joined in the community as a young artist. Again I refer back to my first year at the West of England. I was feeling lost and persecuted but won a small prize at the students exhibition which was awarded by Peter Lanyon. The fact that he read my stumbling efforts to evoke sensibility out of hesitant marks penetrated into my soul and I came to believe in myself and that I was maybe 'viable'. This connection in my life drew me again to St. Ives but unfortunately I did not have the resources to attend his private art school called St. Peter's Loft. I was aware of course of all the artists and occasionally spoke with some in The Sloop. I decided to give up thick impasto paint and decided that I needed some way to work that did not rely on gesture and expressionism. The boats in the harbour fascinated me and I was mindful of how Ben Nicholson extracted linear and tonal relationships from that, and also the textures of granite walls (picture below left). I was also suspicious of the righteousness in full force regarding abstract painting. 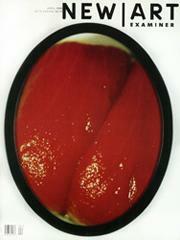 I sensed in my bones that at some point an image would have to return to painting and it could not be ex-communicated. I started to paint directly from observation and sketches: alone except for artists from bygone eras eg Leonard Fuller and others. (By the way if you go to the White Hart in Hayle at the end of a corridor I think on the second floor you will find a portrait of me painted by Leonard Fuller.) Peter Lanyon visited and again was enthusiastic and helpful and understood that I was responding to the visual beauty of St. Ives and environs. 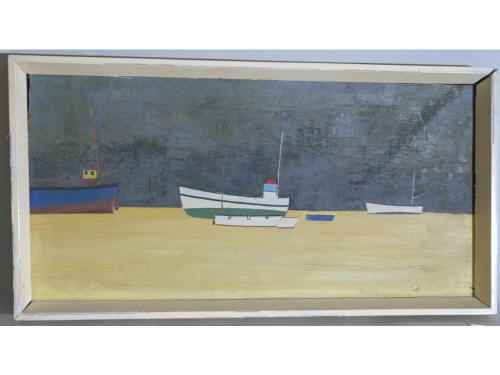 After working in St Ives for a year or so in my then new style-slightly stylised boats, harbour walls, and horizons etc. I amassed a body of work and tried my hand in London. I got an exhibition at the Portal Gallery which in retrospect was a great mistake. The Portal gallery off Bond Street was a very small space which did not matter as my work was small scale. The gallery specialised in naive painters and developed an active market. My work was not technically advanced but the image stuck and even more so given the zeitgeist of the times. Everybody and I mean everybody was abstract. The American painting had arrived and I think I was virtually the only young painter who was non abstract. It was a cardinal sin. I remember quite clearly saying LS Lowry was a good painter and being met with total disbelief. Who were the few figurative painters around St Ives then? The Le Grices, Jeremy and (the late) Mary Stork were figurative painters, graduates of the Slade. Margo Maeckelburgh was also painting her style virtually the same as today. Also Ken Symonds a traditional painter and the late Alan Lowndes who was a very good painter: self-taught but really committed and represented by Crane Kalman. (As I write I hear that his work just reached record prices at auction). Was your show well received? Yes and in fact I had three sell-out London shows. Alan Bowness and others, including the Contemporary Art Society purchased work, and I believe that piece has found its way to the Southampton Museum. But I did not break into having serious critical attention paid to me though I was well reviewed in the daily papers and some art magazines. I was young and not savvy. The Marlborough was interested but, as a personality, I did not have the self-assurance that I think necessary for young painters to have to convince dealers that one is a good bet. I lacked the pushiness of a Damien Hurst or Tracey Emin. Bernard Leach was interested and took Mark Tobey to a show and later wrote in a private letter that he and Mark Tobey thought I had a germ of an idea. I became a member of the Penwith Society which was lively in those days. I well remember a rebellion lead by Denis Mitchell and Alexander MacKenzie and one other protesting the total dominance of the board by the Leach and Hepworth families. An interesting event in the history of St Ives. During these years I read much and got to understand that St Ives and Penwith did have different generations of good artists both traditional and modern, and that the town became a world art centre even without an art school or museum. I came to understand that the written word, or informed criticism, plays a crucial part in the development of any significant art movement. I realised that Patrick Heron as a writer, Bernard Leach as a writer, Adrian Stokes, Alan Bowness, Herbert Read, and Naum Gabo as writers produced informed under-standing of visual culture and St Ives, that little town by the sea, became a national and international art centre as a result. But you didn't stay in St Ives did you? Progress was not possible for me. I was a fashion-outsider and dubbed naive. I was recommended for a Commonwealth scholarship by Alan Bowness who I think was sympathetic to my plight and I departed for two wonderful years in India. I lived in St Ives for three years altogether and saw the writing on the wall as tourism was beginning to gut the town. A tide of banality was washing over it, driving out the art-life and local community-life. I went to Newlyn following the lead of Giles Auty, a conservative personality and self-taught artist who exhibited at the Royal Academy and played cricket for Cornwall and Penzance, who in the Thatcher years became art critic for the Spectator. I became an active member of the Newlyn Society and arranged two fancy dress balls that saved the budget. There were no grants in those days. On moving to Newlyn I purchased a semi detached cottage high on Chyonne Hill that previously was owned by Harold Harvey. The magnificent views over Mounts Bay meant that no matter where my life journey would take me, Cornwall had become home. I left for India and my life changed as I learnt that their ways of thinking about art, life and the creative process in a manner that was not open to me as young English person. I was, in some respect, prepared for this as I had listened very carefully when possible to the wisdom of Bernard Leach who spoke of the issues of East and West. He planted seeds for which I am extremely grateful and blessed to have received. In particular I came to understand another history of modernism. 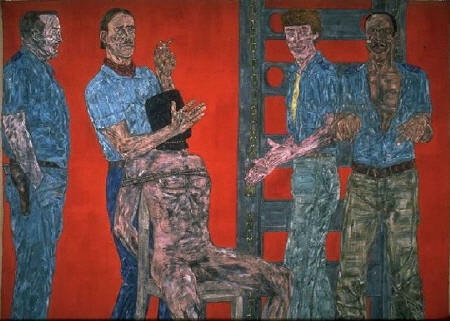 One revealing experience in India was the arrival of the massive exhibition: 'Two decades of American painting'. There was a three day conference designed to involve Indian painters. I watched Greenberg perform and had much conversation with the American cultural attache or Art Officer in New Delhi. It was clear: the American 'push' was on. And affecting the whole world...so what happened when you returned to the UK once more? On returning to London, the 60's were in full flow - Carnaby Street, the Age of Aquarius, the intense sharpness of the angry young men had given way to the fun and games of conspicuous consumption. Young people had money in their pockets, the market responded, and I realised I was a fifties kid. As the London scene had switched from dreaming about Paris to dreaming about New York, I realised that American culture was dominant. I decided that if I had to deal with American culture I would be better off in America to understand it from the horses mouth. I arrived in Chicago a few months after the Democratic Convention Riots in 1969 and got a part-time teaching job in Chicago which was agreeable as I wanted to learn American culture before taking on New York. I had learnt by now that capital cities are more to do with other capital cities or metropolitan centers than the country or the hinterland they are located in. It was in Chicago State College that I meet Jane Addams Allen, a fellow lecturer and we became partners and later we got married. Jane was graduate from the University of Chicago and the School of the Art Institute of Chicago and had spent much of her twenties in Europe as an artist so had a thorough grasp of European art history as well as American. Her great-aunt Jane Addams Allen was a great American who won a Nobel Peace Prize and was a great social reformer who helped shape social services in present day USA, as well as making philosophical and educational contributions, sharing a philosophical foundation with John Dewey and other American philosophers of the Pragmatic school. Through accident we became art critics for the Chicago Tribune and had a wonderful time reviewing shows once or twice a week. The departure was unpleasant as we were fired for no reason that was made known to us. 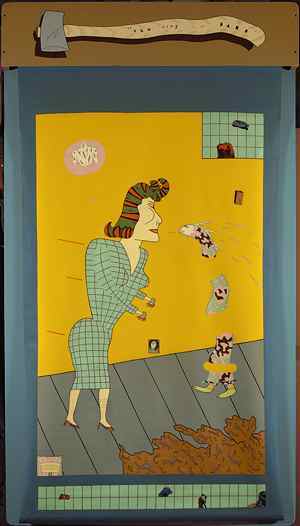 We had established an enthusiastic following in Chicago which in part was due to the fact that we did not conform totally to the prevailing orthodoxy of boostering and supporting the emerging and dominant art of Chicago, the Chicago Imagists or Hairy Who. We challenged the performance and policies of Chicago's new art institution, the Museum of Contemporary Art. 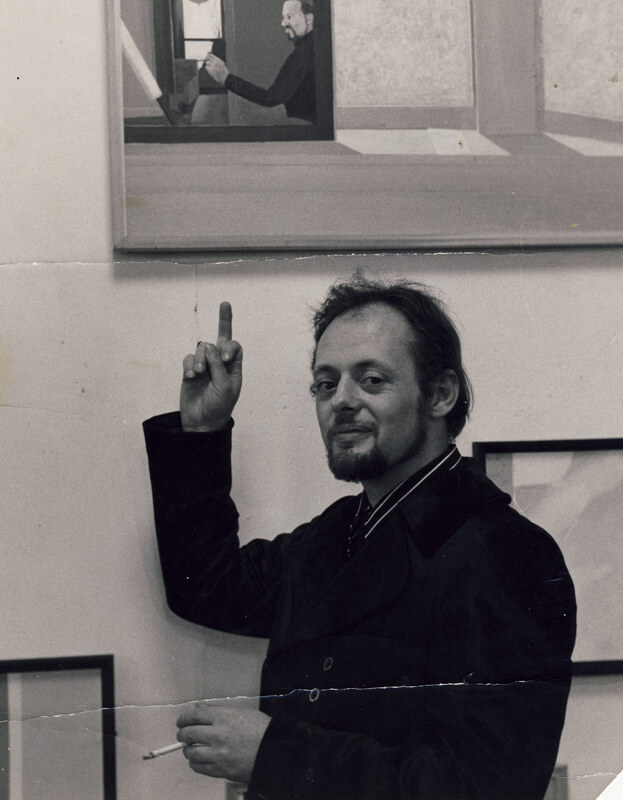 We were art savvy but politically inept - we did not understand the zeitgeist of Chicago. Our political innocence was our downfall but in the long run was in my opinion our salvation as, simply, politics is comprise and art is not. We saw criticism as dialogue free from the requirements of boosterism - in this case for local artists. Chicago is a city particular to itself and as Studs Terkel, that great American writer and recognised authority on Chicago wrote with piercing accuracy. "Our incapacity to accept criticism, a criticism built on a love of what can be appears to be hardening rather than softening. It is our own cold war against the world. You are either with us or against us." Though Chicago is very beautiful - magnificent buildings set against the vast open space of Lake Michigan, you see the underbelly of Chicago in its drama eg David Mamet, in the old socially conscious poets and writers - Sinclair Lewis, Carl Sandburg. 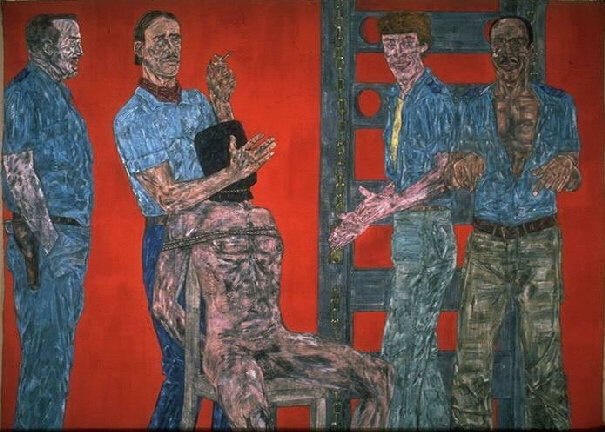 The post-war years produced expressionist painting dubbed the Monster Roster: the notable artist being Leon Golub (picture above left) who after going to New York became recognised as America's painter of conscience. The following generation laid a funky veneer of tight meticulous surfaces but perpetuated a sense of menace, the new ingredient added to the traditional was a camp twist that reinforced a self conscious anti-intellectualism. If Golub was the best known of the Monster Roster, would someone like Jim Nutt (picture right above) being a good example of the Hairy Who? Yes. They were nearly all figurative painters of various kinds. Chicago art picked up in part on West Coast funk art, recycled kitsch, obsessive art of outsiders, and the highly decorative exotica of tribal art found in the Field Museum. We thought that Chicago had much good art and much came also from the Chicago Bauhaus that Moholy-Nagy founded. The major collectors were not interested and that meant the Chicago museums were not interested so the deep investments made both emotionally and financially could not be challenged and the excellent Chicago art devoted to abstraction and architectonic structure was neglected and eventually faded. We also faded and had to seek a way to continue on with a career art writing. We tried to write for the New York magazines and had a major story on the Sao Paulo Biennale lifted off the press a few days before publishing when the Chicago art mafia (my words) pressured Art News with the threat of an advertising boycott on the magazine. Jane with the wisdom of her ancestors speaking through her simply said that if we want to be art writers we are going to have to be our own publishers. We were lucky we had community support and with much volunteer help and no money in 1973, we managed to put out Vol 1, No 1. The first issue of the New Art Examiner was an eight-page newsprint, now a collectors item. The page 1 editorial though written then says it all, that is that the problem of provincial art scenes are similar, and that applies to Chicago, or St Ives, or Bristol or anywhere else. The centre, historically London, Paris, or New York, defines the relevant or so-called important issues and good art by publishing informed criticism. The art world is strange and there is a problematic and strained relationship between money and idealism (or the market and quality). Cornwall was fortunate with the St Ives school and the Newlyn School as those artists, even while living in Cornwall, found a critical response in London. Usually there is a resentment in the regions against the centre and that resentment or frustration takes refuge in a narcissistic self-identification frequently relying on the time-honored romantic myths of the independent artist. The regions do not support informed criticism, regional Museums and artist organisations will exhibit local art and occasionally produce catalogues that usually are simply publicity sheets. As in Cornwall there is always the so-called education program usually reserved for children and working class people. The significant issues of cultural analysis or how the art system works are always avoided. Boosterism or publicity is the underlying order of the day. 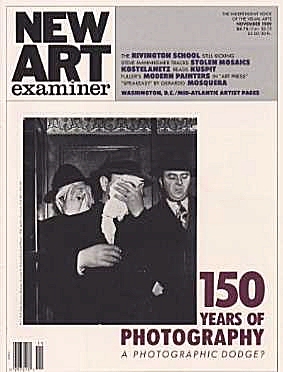 Jane Addams Allen and myself naively thought that Chicago - which defines itself as the second city - was big enough to support an art magazine that, if it achieved quality, would be viable. It did attract top national writers and generate many that subsequently became established. 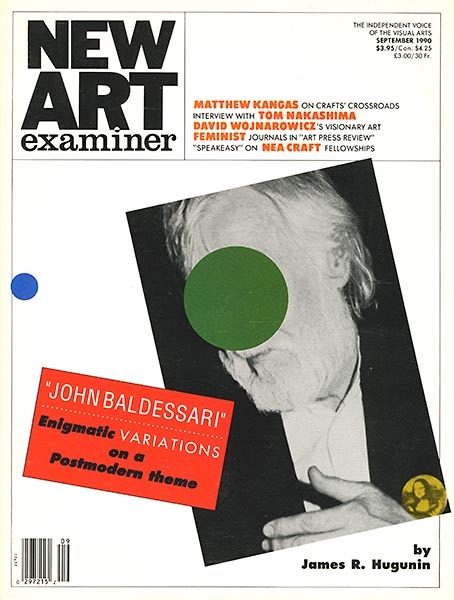 The ultimate failure of The New Art Examiner is complicated but the lesson learned was simply that the nature of power is intertwined with the making and the appreciation of art and unless that reality is understood by artist and consumer that particular art scene will be lack-lustre. Cornwall has been lack-lustre since the fifties as - simply - inertia and banality like ivy and weeds grew over the originality that was there. But how does that come about over time? Profound anti intellectualism finds an all too comfortable niche in the provinces. Cornwall is a prime example. Alfred Wallis - a significant naive artist - discovered and recognised by Ben Nicholson has entered into art history and folk law. Nicholson saw with a peering eye that Wallis used certain procedures that had significance and he borrowed them. But for most other people Wallis became an excuse to be lazy and intuitive and follow instinct. He has become a cliche. As Alan Lowndes once said "Alfred Wallis was not a good painter because he was naive, he was a good painter in spite of being naive". Naive artists are held up as mortals living in a state of art grace. The Cornishman is a prime example of provincial writing. It does provide a lesson of the limitations of the popular press. Frank Ruhrmund, whom I have not met, is a retired English teacher who occasionally writes on theatre. Here his passion and care comes through. I enjoy his theatre reviews, but when it comes to art he churns out cliches, and either avoids or cannot handle the important issues in Cornish art. But there are issues which need to be dealt with. Of course. But his avoidance of the impact that Brian Sewell had with his visit in 2007 is prime example of a cultural happening that should have been properly recognised and reported on. Brian Sewell was invited to speak at the Acorn and said that he doesn't really buy into the myths about St Ives, and suggested that Patrick Heron and Barbara Hepworth are over-rated, which caused some gasps from the audience. He went on to attack and even demolish the then current Tate St Ives exhibition: 'Art Now Cornwall' the swan song of the departing director Susan McElroy-Daniels. Ruhrmund was aware of controversy that Brian Sewell stumbled upon and the way he brought a new focus to Cornish art. But this episode is important as it neatly underlines on the problem of timid or ignorant cultural reporting. Ruhrmund apparently in private referred to situation as a spat, and in so doing patronised the well intentioned and lively new energy appearing in the Cornish context, thereby avoiding the issues that are important and regulating artists to the status of children in the playground and so doing kills any possibility of serious conversation. The problem of provincial criticism now may have assumed the same problems as metropolitan criticism. It is a deep problem. Though New York has a rampant market it has lost the authority that it once had, and the loss of authority is a cultural phenomenon that has to be understood in the same way as the loss of authority that descended on Paris when New York became the epicentre for world art after World War II. We live in a shrinking world and information and media dominate and are more easily available than before, and that in many ways gives the artist no matter where he or she lives the opportunity to be aware of what is happening elsewhere. But that does not ensure quality discussion. Unfortunately there is frequently money available to support space for art but little or no money available to support writing and thinking in the regions. There will be money available to import artists from the centre to the edge but not money available to bring artists from the edge to the centre, unless they are cutting edge artists. But it is the centre who decides who are cutting edge artists. Well put. Talking of the 'centre' how do see the Tate's influence or role in St Ives and Cornwall now? It was hoped by many that the St Ives Tate would bring prestige and success to contemporary local artists. It has not and is unlikely to. The Tate is a regional museum that has inherited a significant collection of art made in the locality. As time passes it will fade into history and be a later chapter in Cornish art, in the same way as Penlee house is a repository for the late 19th Century Newlyn School. The obvious problem of the St Ives Tate is its appalling architecture. It appears to have been designed by Saddam Hussein and deserves a location on the banks of the Tigris or in Las Vegas - maybe next to Caesar's Palace! The culture of the Tate is the same as all museums: a process to manage and present art and artists that inevitably ends up as monument to the presenters rather than what is presented. The Penwith society is now moribund, and a distant echo of the past, and so the Tate is the palace on the hill that promises something new. Interesting exhibitions are sent down from London which is a blessing, and an opportunity to see what the important people are thinking. Sometimes trendy and banal, and sometimes interesting and substantial. And how do you see the future? There was a time when St Ives, even though a small town without Art school or Museum drew artists, poets and writers from all over the world, as it had creative life. The tourists have eliminated that possibility. Penzance and Newlyn could again become a little Mecca, but will only do so when the problem of definition becomes paramount rather than a belief that a creeping osmosis will provide the answer. does not, on the whole, interest itself in the issues of the environment. Concern for the earth and the natural world will bring in a new episode of art that will relate to the issue of landscape. I believe and hope that artists in Cornwall are in some ways responding to that new challenge but I am not so sure that the back up that is required in today's complex world is here. It remains to be seen but while art is being made and while there some discussion as there is on this website, something may happen in spite of the new problem, which is the confusion between success and publicity, and between popular art and high art.